Other Press (NY), 9781590512241, 350pp. Bruce Bauman's work has appeared in "Salon, BOMB, Bookforum," and numerous anthologies and literary magazines. He is an associate editor of "Black Clock" magazine and is adjunct professor in the CalArts MFA Writing Program. He is married to the painter Suzan Woodruff, and lives in Los Angeles. "[And the Word Was] is utterly absorbing, a page-turner in the most literal sense of the phrase. Seamlessly structured, it is at once intellectually ambitious and emotionally alive. 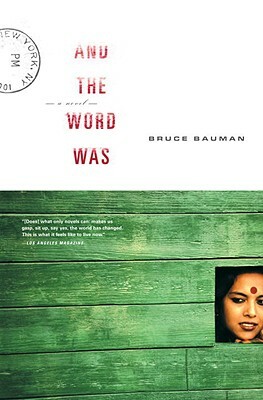 Bruce Bauman is one of the most engaging and engaged writers and thinkers that I know." - Rebecca Goldstein, author of The Mind-Body Problem and winner of a MacArthur Fellowship, the Jewish Book Award, and a Whiting Award. "This book in its entirety is deelpy moving, sophisticated, intricate, elegant, with a neatly woven narrative and powerful culminations. It is a loving, sensitive novel, which asks many hard questions about life and faith."